Rudolph Hess in Whetstone ? When a local paper unearthed a letter in Barnet Council's planning archives that read "We purchased 'Tower House' in 1953 and have operated from here ever since. It was built many years ago as a private house. In 1939 it was a boys' boarding school. During the war it was at different times a blood transfusion centre, a fire service station (hence the corrugated iron sheds) and a prisoner of war cage (Hess was brought here for interrogation after he flew to Scotland). After that it was unoccupied and derelict until we took it over." It opened up a mystery. Was the letter genuine? In it he informed his neighbours that he wanted to demolish the building and erect luxury apartments in its place. As he was the managing director of WH Jones and Co, an export, finance and banking company run from the four-store building, and that he later went on to stand as a Liberal Democrat for the Chipping Barnet seat does not mean that all this is not a lie or a prank and perhaps if anyone knows him we could add to this history. Historians are skeptical, and say that Churchill and Hess never met, but if they had it would have been in secret and not of general knowledge. Rudolph Hess was Adolf Hitler's Deputy and no one really knows why he decided to fly solo to Scotland in 1941, where he was captured and imprisoned in The Tower of London. It would have been unthinkable if the public thought that Churchill was meeting Hess to do a deal as at that time England was on her knees and left alone to fight Nazism so perhaps Hess came with an offer. It is hard to believe that a prime minister of a country would not be curious and want to meet the enemy face to face. During the war construction workers built living quarters, kitchens, showers and toilets which could have been used by the fire station or as a safe house. The question there is why they did not interrogate prisoners of war in one of the big houses in Totteridge or Hampstead. Perhaps a reason why this building could have been used is that it is quite near Trent Park. In the early twentieth century, this was owned by Philip Sassoon (the cousin of the poet Siegfried Sassoon), and he entertained many famous names at Trent park including Winston Churchill. During World War II. Trent Park was used as a prisoner of war camp for captured German Generals and Staff Officers. They were treated well with special rations of whisky and regular walks on the grounds of The Park. 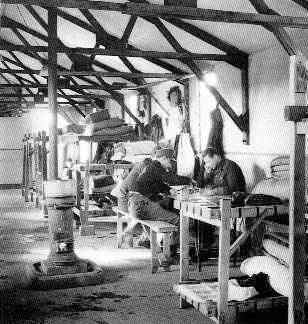 Un-be known to the Germans the camp was wired with hidden microphones and listening devices so that the British military was able to gather important military information. This is only up the road from where the most important prisoner of war was supposed to have been interrogated. Would it not have been ideal and near those interrogators that were up at Trent Park? Whatever the truth strange other things were happening in Oakleigh Park North during the Second World War. In the Barnet Press dated October 13, 1951 there was a headline that read 'Britain Silences Russia's listening Post in Friern Barnet'. It went onto say "The radio monitoring station of Tass, the official Soviet news agency housed in The Lodge, 13 Oakleigh Park North, was closed down by Foreign Office request on Sunday, not two years after Friern Barnet Council had tried unsuccessfully to have it shut on planning grounds. The Lodge, a solidly-built double-fronted house standing in large grounds is surrounded by an extensive network of aerials and cables." A local resident who lived on the road was quoted as saying that the house had been owned by the Russians since before the Communist revolution in 1917 and that it was still active until it was demolished in the 1960s. "I used to see Russians walking about," said a Mr Bryden "The drivers would be standing around outside with their big Volga cars, looking very Russian. We didn't take any notice. They kept to themselves." Another local resident, Allan Peacock, was a postman in Whetstone in 1946, and regularly delivered post to the Tass news agency, which he said was in a large house where Clydesdale Court now stands. Professor Richard Aldrich, a Cold War Intelligence expert from Nottingham University, wrote about the Whetstone Tass base in his book, Hidden Hands. He had found four previously top secret Foreign Office files at the Public Record Office in Kew and one of which says that after the radio monitoring station was closed, the Russians were allowed to stay at the base to produce Soviet Monitor, their daily news sheet thus corroborating Mr Bryden's evidence. So we have the rumour that Churchill meet Hess at number 17, there were Russian spies at number 13 and then a local paper discovered that Winston Churchill dined at number 11. The person that lived here was Sir Alexander McColl, who played a vital role in ensuring the supply of oil during the war. 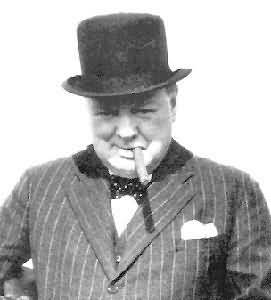 He was knighted in 1946, and he was a director of a large oil company called Vacuum Oil (which became part of Mobil), He was also the chairman of the wartime Lubricating Oil Committee on the Petroleum Board, which made him quite important at Whitehall and obviously came into contact with Churchill. Perhaps Churchill went to number 17 and met Hess and said what the listening Russians wanted to hear and after that he went to number 11 for his chicken dinner. Not within the realms of possibility if Churchill wanted the Russians to know that he was not going to do a deal with the Germans. Whatever the truth something was going on in Oakleigh Park North and it would be nice to hear from people with their stories so that we can try and get a little bit further to solve this mystery.